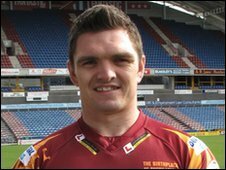 Huddersfield Giants have completed the signing of Wakefield Trinity Wildcats scrum-half Danny Brough. The 28-year-old Scotland international has signed a four-and-a-half deal which ties him to Huddersfield until the end of the 2014 season. Huddersfield have agreed an undisclosed financial settlement with Wakefield for Brough after protracted negotiations. The Giants have also let prop Michael Korkidas and utility forward Danny Kirmond join the Wildcats on loan. Greek international Korkidas, 29, who also spent last season on loan to the Wildcats last year, again moves on a long-term loan, as he is now contracted to remain at Belle Vue until the end of the 2011 season. Kirmond, 24, has signed for the Wildcats on a shorter term loan. "We're delighted to re-sign Michael Korkidas," said Wakefield coach John Kear. "He is an integral part of our plans to develop a successful Super League team here. "Equally we're excited at being able to work with Danny Kirmond who is a player we've admired for quite some time. "We would like to thank Danny Brough for all he has done for this club since he joined us from Castleford and wish him well in the rest of his career." Former Hull and Castleford man Brough, who scored four tries in 48 Super League appearances in just over two years at Wakefield, has been a long-time target of Huddersfield. Giants coach Nathan Brown first revealed his interest in him almost a year ago - and Brough now sees his move to the 2009 beaten Challenge Cup finalists as a chance to win silverware. "I felt ready for a new challenge at a new club," said Dewsbury-born Brough. "At Huddersfield with Nathan Brown, I think the opportunity presents itself for me to play in the big finals. "Huddersfield are a club that should be pushing for a top-two position and the Grand Final. "I'm glad that all the speculation has now ended and my future is settled. "I would like to thank the Wakefield club and their fans for their support of me. "I like to think that I have contributed to their rise up the table to the point where they are now sitting in the top part of the league on a regular basis. "In particular, I have enjoyed working with John Kear who has been great to me for a long time." Huddersfield coach Nathan Brown said: "I've admired Danny's game since I came to the UK and it will be fantastic to be able to work with him and integrate him into our team over the coming weeks and months. "Out and out half backs with outstanding kicking games and genuine speed are becoming a rarity, so he will give us another string to our bow."